Today's my dad's birthday (happy birthday Dad!) --and also my sister's birthday (happy birthday Ashley!) --and also my cousin's birthday (happy birthday David!). What better excuse to break out the cupcake this new cupcake cookbook (sent by the publisher for review--and what better way to review a cookbook than to, I don't know, cook from it?)? 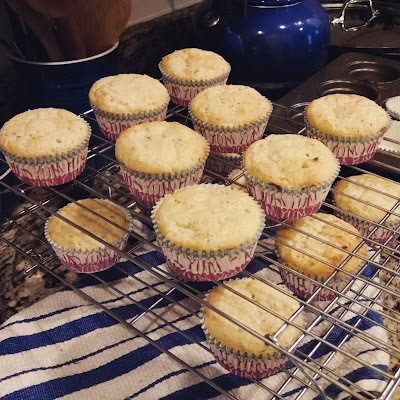 We're not a big dessert family, so I opted for one of the savory options from Sweet, Savory, and Sometimes Boozy Cupcakes: Rosemary Parmesan Cupcakes + Lemon Zest Frosting. 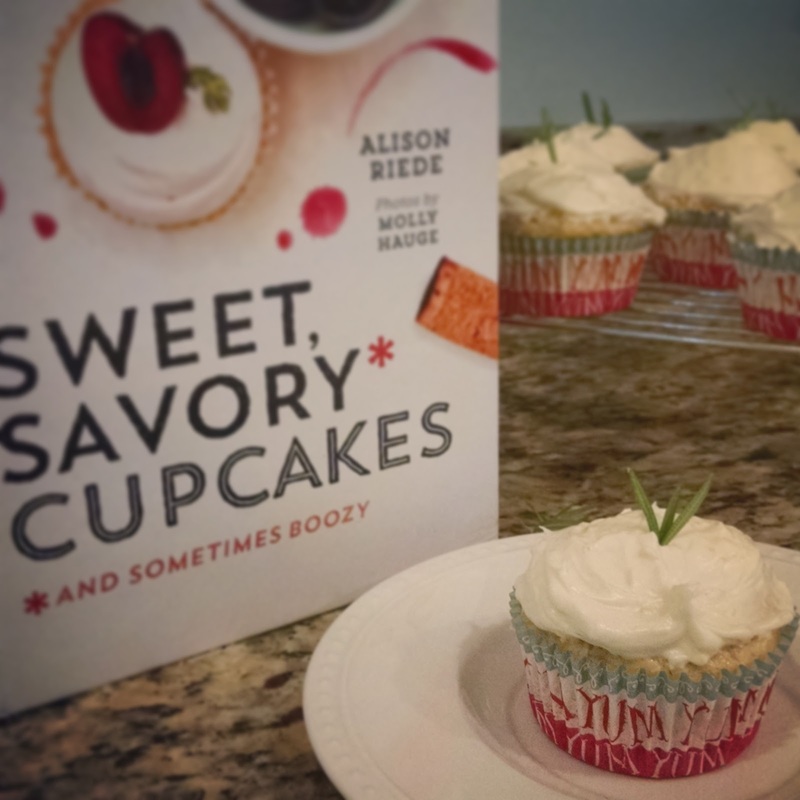 Author and cupcake chef Alison Reide (2011 winner of the Food Network show Cupcake Wars) has found a way to make cupcakes that are light and fluffy and chemically proper, without being abundantly, sickeningly sweet. Added bonus: the recipes in Sweet, Savory, and Sometimes Boozy Cupcakes are both accurate and easy-to-follow. 1. Preheat oven to 350 degrees F. Line 16 cups with paper liners. 2. In a large bowl (or the bowl of your stand mixer, if using a stand mixer), mix together flour, sugar and baking powder. 3. Beat in, on lowest speed, milk, butter, vanilla, and egg. 4. With mixer off, add cheese and rosemary, and slowly fold in with a spatula. 5. Fill cupcake liners three-quarters full and bake 20-25 minutes (mine took 23 minutes total), until a toothpick in the center comes out clean. I'd be careful about over-cooking as the cheese will brown the edges. 6. Let cool completely (I left mine for about 2 hours, but that was because I went for a run...) before frosting. 1. Beat butter, cream cheese, and lemon zest with electric mixed (I used a stand mixer, but a handheld one would work as well). 2. With mixer on low, slowly add confectioner's sugar. Mix until incorporated. 3. Add olive oil slowly until the icing reaches the consistency you prefer for your frosting. 4. Beat on high 2-3 minutes until frosting is light and fluffy. Spread (or pipe, if you prefer) over fully cooled cupcakes. 5. 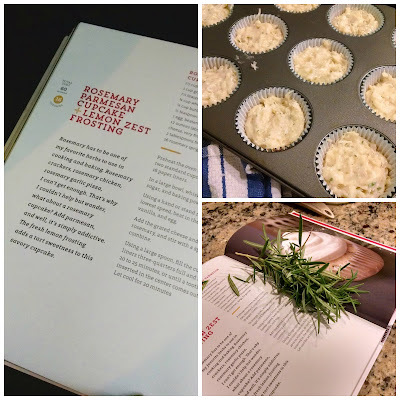 Garnish with rosemary sprigs. 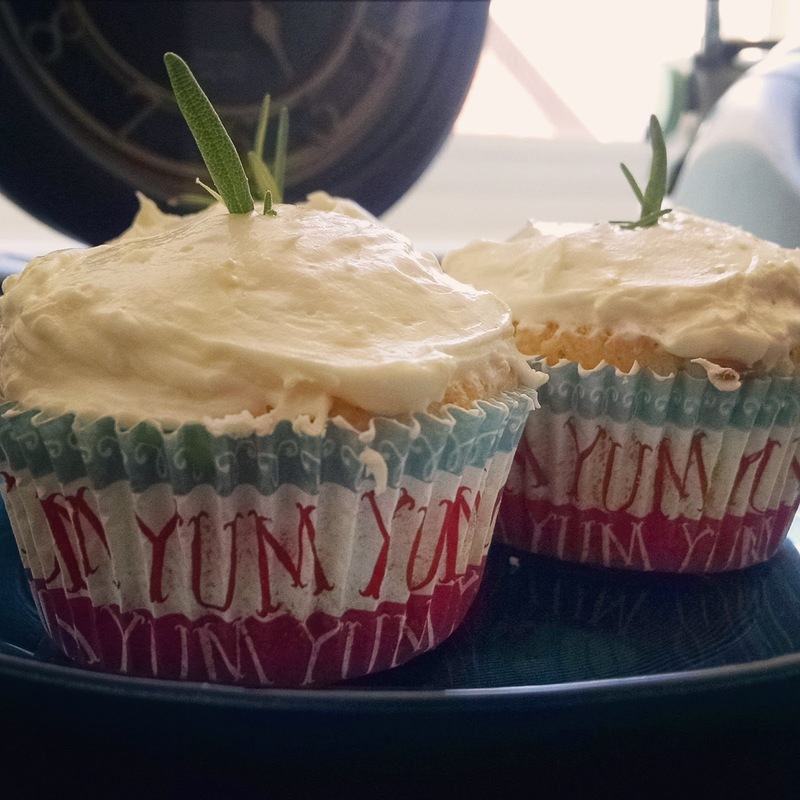 Up next, I think I'll be trying Margarita Cupcakes + Tequila Lime Buttercream. Or maybe Earl Grey Cupcakes + Earl Grey Lemon Zest Buttercream. Or a Fig Cupcake + Pear & Fig Filling + Honey Brie Buttercream. The possibilities are endless! I was sent a copy of this title for review from the publisher. Opinions my own. Welp - I need this baking book asap. They look tremendously good! Yes! Sort of like... a slightly-sweetened cornbread? I mean, it doesn't taste like cornbread, but it's the same balance of sweet and savory as cornbread can be. It's a really fun book--tons of ideas I'd never have thought of on my own. Oh my gosh, these look awesome! I'm actually surprised at the sugar levels for a more savory cake, but I get what you're saying in the comment below about it being like a sweetened cornbread. I already wrote on Leah's post that I think this book may end up on my cookbook shelf. Happy (belated) birthday to me! Yes, I know what you mean about the sugar. The parm cuts the sweetness though, so they still end up mostly savory. And this is a perfect belated birthday gift to yourself--so many fun recipes! Rosemary? Parm? Sobbbbb. You've got me crying cause I want these NOW. I wonder if my library has that book. I'm supposed to be getting rid of cookbooks not finding more.